All-Terrain Vehicles, better known as ATVs, four-wheelers, or quads handle differently than other vehicles, such as motorcycles, cars and side-by-side vehicles. Learning how to ride your ATV properly is important and fun. Not only that, but ATV safety courses are absolutely essential for first-time riders, and we have classes for every level of rider. 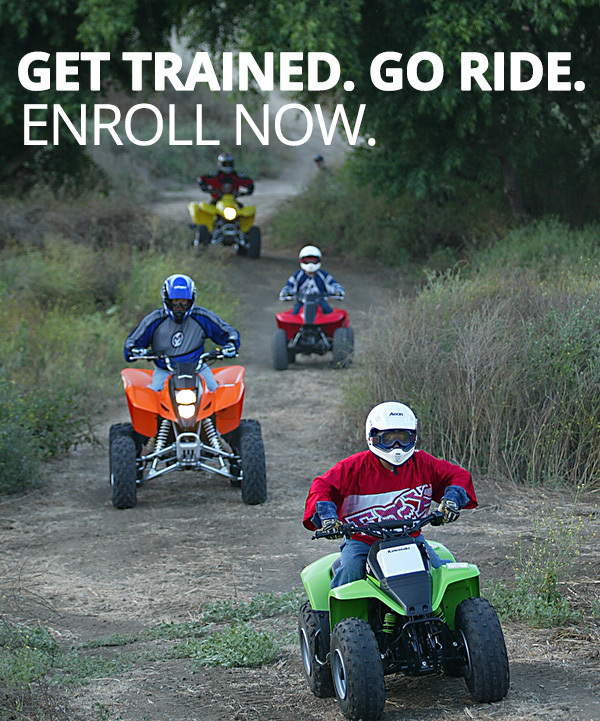 The ATV RiderCourse is a hands-on, half-day class conducted by an ATV Safety Institute licensed Instructor. It’s a great opportunity for you and your family to increase your safety knowledge, practice basic riding skills, or just brush up on your skills in a controlled riding environment. We offer classes for riders age 6 years and older. The ATV RiderCourse is a great way to get your kids off to a safe start. Check out our class types to see which is right for you! Enroll online or by calling 1.800.887.2887 Monday through Friday 6:00 AM to 5:00 PM Pacific Time.